Good things come to those who wait…or so they say. However, this was something I had to wait quite a long time to get. In hindsight though, it just seems to be a pattern for me that something comes along right when it is exactly needed. After a long week of ill health and an unending grind at work, I sat down to start my holiday weekend with yet another drop off in my box from the fine folks at Sekai Project. This time it was a the latest volume in a series I have come to know and like quite well, Nekopara. I thought I knew what I was in for but over 72 hours later and virtually non-stop playing, it is as if I have gone back to the feeling of novelty that I had when I played the first one. Though familiar, it feels new. Though like 1, it improved upon 2. Our story this time takes a slightly different turn as we find our hero Kashou continuing to run his bakery along with his lovable catgirls, four of them now his catpanions. The shop is now even more famous because of the blog run by the ever devoted, and still hopelessly obsessed, Shigure. So much so, that people are coming from far off cities just to eat there and meet the catgirl staff. The plot begins to thicken on a trip to the amusement park on their day off as Kashou finds out how big Shigure’s blog really is and Cinnamon and Maple revive a dream and friendship that had, up until then, waned somewhat. After seeing an old video on the blog where a young Maple and Cinnamon are singing the theme of their favorite magical girl anime, Kashou asks her if she still dreams to be a singer. Though she dismisses it, she is soon confronted again during the stage show at the park where Cinnamon gets, quite literally, wrapped up in the show and, to “save her”, Maple is compelled to take the stage and sing that very theme. The astonishing performance and her bond with Cinnamon becomes the centerpiece of the story from here on. From learning instruments to finding the true meaning of friendship as well as the courage to live their dream, we embark on a journey of heartfelt emotional scenes and frequent comic relief as our two catgirls attempt to make a childhood fantasy an adult reality. Through it all, they also come to grips with their relationships with both each other and with Kashou going from hesitance of their love for each other to fully embracing it and from a general indifference toward Kashou to a determination to be his number one catpanion. 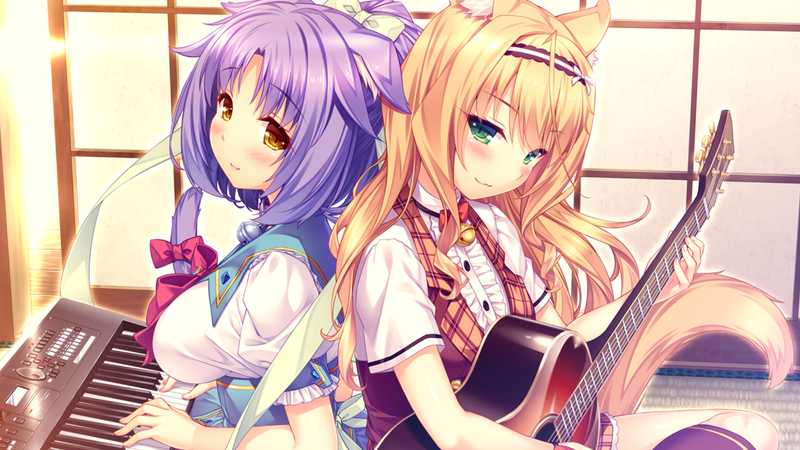 The story ends with both girls having accomplished a knockout performance for one of Kashou’s friends, become his latest and greatest catpanions , and see themselves united as a family with their sisters under “The Sun”. In respect to this game’s attributes, I’d like to start with the most obvious, which is the artwork and animation. To improve upon Sayori’s already excellent character designs, the creators have added additional facial expressions and increased movement to the animation. This makes the characters far more fluid and lifelike, which I found to be one of the biggest improvements of this volume. They also have added closeup pans of the background and, in some scenes like the stage show scene, have scrolling insert images, another aspect that I found to be quite a nice touch. The CG scenes were, as always, expertly done, including the animated ones, which were perfectly smooth in motion and realistic in their physics. I also liked the new backgrounds and text box “talking heads”, which I think were used far better in this volume as a way of balancing characters depictions in context of their placement, such as when Cinnamon is talking to Maple while standing beside Kashou. Last but definitely not least, we actually get a good look at Kashou’s face! Though we have caught some glimpses before, this is the first time we really have seen it in its entirety and I am impressed. Though a good bit of the soundtrack and sound effects are unchanged, I still love them and the new opening and ending themes is absolutely stellar. However, Maple’s rendition of Grandfather’s Clock is on an entirely different level. Considering the vocalist’s (I assume to be Maple’s) primary language is not English, this was one of the best versions I’ve ever heard. In fact, I think I found it as stimulating as the characters did in the story. On the subject of the voice acting, it seems everyone has really hit their strides in respect to their characters and have hit a level of depth and dimension that I think is optimal, if not ideal. Also, the technical aspects of the game have been greatly improved with the addition of the jump feature in the back log, allowing the player to jump back to replay a scene, which I found really useful for making bookmark saves. However, the most profound aspect of Nekopara Vol 3 has to be its story. It was familiar to be sure but there was something completely new about it. One of these aspects is the fact that we have a few periods of narration that are not Kashou’s but rather Maple and Cinnamon’s. Unlike the short monologue with Shigure in the first volume, we have multiple scenes where it’s the catgirls who tell the story. Now, who is exactly telling the story in the scenes is not entirely clear but if the dialogue is a clue, it is both Maple and Cinnamon speaking in unison. Another aspect of the story are the nods made to the first volume in terms of actions and flashbacks. The first example being the scene where Maple gives the newly arrived Cinnamon a tough love pep talk, pulling the same heartstrings as the story of how Kashou cared for the sick Chocola and Vanilla when they first came to the Minaduki household. Then there are the flashbacks on specific utterances that each of our two main catgirls have made when Kashou realizes something, which is also found in the first volume. However, the most interesting of all is the scene on the boat after the performance. Maple and Cinnamon get very emotional and start crying followed by Kashou petting them on the head to comfort them. The scene is almost identical to the one at the end of the first volume, right down to Kashou’s hand placement. These aspects gave me the sense of the familiar but the story goes in a number of completely new directions as well. One of these is the yuri facet of Cinnamon and Maple’s relationship, which is a first in the series. I think the creators made an interesting addition to the story here as it is not placed without reason. Maple’s reluctant feelings about romance in general seems to stem from the conflict within her about returning Cinnamon’s intimate affections. In fact, it fully explains why Cinnamon gets hot and flustered so easily and why Maple gets so unconformable when she does. Once they sort this out, they both seem to be less conflicted with each other as well as more romantically inclined toward Kashou. Speaking of him, we find Kashou far more sentimental than in previous volumes. Whereas in the first one, he was very selfish and aloof to his catpanions, he seems far more affectionate, attentive, and passionate with them in this one. He more often professes his love for them and seems even more devoted to them than before. With the increased emotional mood of the story in general, we not only see through Kashou’s eyes but also feel through his heart. These sentiments are amplified in the H scenes where the catgirls strongly reflect them, conveying the mood eve more intensely. I would like to say that this was something that I really enjoyed, for once you really do feel the love and it makes the experience all the better. So, the story is very familiar but at the same time it really seems to be a completely new game underneath it all. Though I did miss not seeing Milk or Vanilla’s “pervert” glare, I really did enjoy this game greatly. I was somewhat concerned when it was delayed so many times, especially the last one involving Sayori’s health. However, it was truly worth the wait as I have found myself in a state of sublimity after finishing it. The story will grab you by the heartstrings and nearly rip them out. You will laugh, you’ll get choked up, you’ll shake your head, and you will most certainly sing along with a star. Though it is already a very successful series, Nekopara Vol 3 outstandingly adds to it. This game is not for those with a cat’s tongue for games. So, use your paws and get it already!